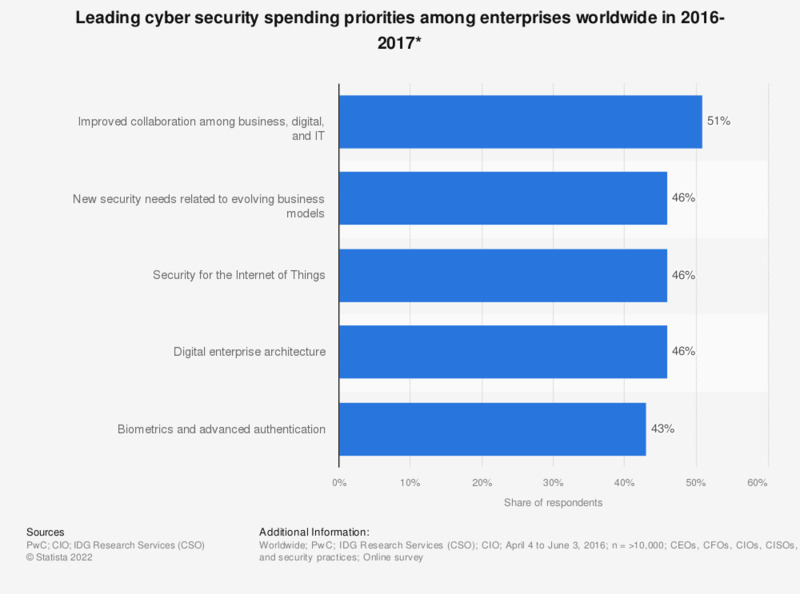 The statistic reveals the leading cyber security spending priorities for enterprises worldwide, over the 12 months following a 2016 survey of C-level executives and IT and security directors. According to 46 percent of respondents, one of the cyber security spending priorities will be security for the Internet of Things and connected devices. * Survey respondents were asked about their cyber security spending priorities in the 12 months following the date of the survey. Statistics on "Business cyber security in the United Kingdom (UK)"
Security services industry in the U.S. Which of the following have happened to your organisation in the last 12 months? Approximately how often in the last 12 months did you experience cyber security breaches or attacks? Have the breaches or attacks experienced in the last 12 months impacted your organisation in any of the following ways, or not? How long, if any time at all, did it take to restore business operations back to normal after the (most disruptive) breach or attack was identified? In the last 12 months, which of the following things, if any, have you done to formally evaluate the effectiveness of your spending on cyber security? Approximately how often, if at all, are your organisation's directors or senior management given an update on any actions taken around cyber security? Which of the following aspects, if any, were covered in any of the cyber security training, seminars or conferences attended over the last 12 months? What type of security incidents do organisations plan for; and how effective are these contingency plans? How high or low a priority is cyber security to your organisation's directors or senior management? Which of the following, if any, are covered within your cyber security-related policies? Which of the following rules or controls, if any, do you have in place? How has the amount of money your company has invested in cyber security changed in the last two years? Have recent high profile breaches made you more concerned about cyber security breaches at your own firm? What concerns businesses most when it comes to managaing threats or risks to electronic data? Which cyber security measures do you take into account when purchasing consumer electronics? Do you agree with the following statement: "Information and cyber security risks are significant"? Do you agree with the following statement: "We are prepared for information and cyber security risks"? What impact has the adoption of a risk-based [cyber security] framework had on your organization?